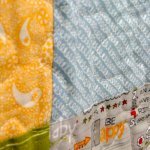 This stunning batik pieced star and floral applique quilt, Timeless Tradition, by Julia Hale of Bits 'n Pieces is a new 9 month block of the month program. Finishing 90'' square, this quilt will be a show piece in your home. Only $24.99 a month for nine months, includes the fabric for complete top and binding. Let your imagination run wild with this book featuring 380 enchanting animal embroidery motifs. Using traditional embroidery, cross stitch, and appliqué techniques, you can create motifs, borders, and alphabets unlike any you’ve seen before. We are thrilled to announce that Deirdre Bond-Abel of the Quilted Crow Girls, our friends from Tasmania, Australia, is coming a day early and hosting a book signing on Friday, May 2, from 11 a.m. - 1 p.m. We will also have their quilts and projects displayed through the shop. 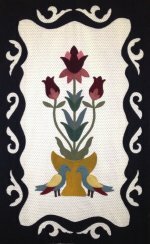 Join Deirdre on Saturday or Sunday to learn the Quited Crow Girls' unique approach to hand applique of wool onto cotton. She's designed a wall-hanging especially for us named Mrs. McKinney's Parlour! This is going to be such a fun time! Join Janet, the HIQ queen of silk ribbon embroidery and embellishings, as she shows you the basic stitches of ribbon embroidery Saturday, April 26, from 2 p.m. - 5 p.m. You can use ribbon embroidery to embellish a number of different projects including your quilts. Register today. Part two of our English Paper Piecing series. This class focuses on the curved pieces like clam shells and apple cores. 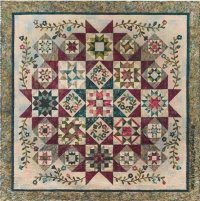 If you you've taken English Paper Piecing: Basic Shapes, or have English Paper Pieced for years and have yet to master the the curves, join us on Saturday, April 26, from 3 p.m. - 5 p.m. Enroll today. Penny will teach you the basics of machine quilting all while having fun. On Tuesday, April 29, from 10:30 a.m. - 3 p.m., you'll learn how to machine quilting using both the walking and darning feet and several techniques. Some work is required before class. Enroll here.